It’s a nice spring day and you’re going about your business, when you’re stopped in your tracks by a rush of pain radiating throughout your tooth and the side of your face. It appears that you have a toothache, so your first concern is with getting the relief you need, and then you’d like to know what caused the pain. Thankfully, your emergency dentist in Columbus is weighing in to answer those questions and more as you continue reading. Stay Calm – It’s important to not panic when an emergency happens. This is because time is of the essence. Thus, your decisions need to be thought out and purposeful. So take a deep breath and then execute. Contact Your Dentist – After you’ve calmed yourself, reach out to your dentist’s office and let the staff know what’s going on, so they can walk you through the next steps. Fractured Tooth – Any sudden impact to your mouth can lead to a chipped or cracked tooth. Also, eating foods that are too hard, like popcorn kernels, can damage your teeth. If this happens, avoid chewing any food on that side of your mouth until the issue has been addressed. If you are experiencing discomfort, you can take up to 600 mg of ibuprofen. Knocked Out Tooth – If you have a tooth dislodged, you should clean your hands, grab it by the crown (the rounded portion) and either place the tooth back in your mouth or let it sit in water or milk. Whichever route you take, be sure to contact your dentist immediately. Item Stuck Between Teeth – If you find yourself with something stuck between your teeth, you can try to floss or rinse your mouth to remove it. If you notice that you have continuous bleeding, though, you should immediately head to the nearest emergency room. 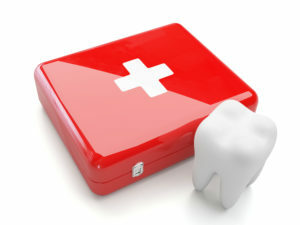 Toothache – A toothache is caused by an infection that has progressively gotten worse until it has reached a crescendo. After contacting your dentist, you can, again, take up to 600 mg of ibuprofen for pain relief and apply ice to the side of your face where the toothache is. Dental emergencies are definitely no fun, but they don’t have to be tortuous either. By reaching out to your dentist for the immediate relief you need and knowing what you can do at home, you’ll soon be back to normal. A native son of Missouri, Dr. Philip Batson earned his dental degree from the University of Missouri-Kansas City School of Dentistry. His quest is to continue the tradition of excellent oral care that his father started over 40 years ago, by providing his patients with compassion and tedious care in a state-of-the-art facility. If you have a dental emergency, you can find Dr. Batson at Healthy Smiles of Columbia, and for more information, you can contact him through his website.